This Swedish researcher is trained at the School of Journalism in Gothenburg and is an employee of the Dagens Nyheter newspaper (Daily News) since 1990. The Dagens Nyheter is published in Stockholm and aspires to full national and international coverage. He is also a lecturer, author and a senior lecturer for the Library Service. He has previously worked as a journalist for Mariestads-Tidningen between 1978 to 1983 and for Norrbottens-Kuriren from 1983 to 1990. Svahn is also vice chairperson and international coordinator of the National Organisation UFO-Sweden since the organisation’s national conference in Halmstad (May 4th, 2013). He is also the Chairman of the Archives for the Unexplained (AFU, Norrköping) since 2017. He is also author of more than 20 books about UFOs, unusual natural phenomena, the paranormal and other topics. 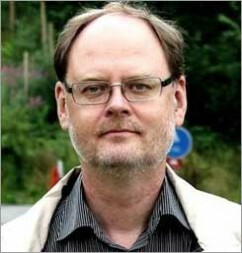 Svahn coined the term “The Third Way” ufology in the organisation’s magazine, explaining that UFO-Sweden should work objectively and without bias regarding the UFO mystery “not skeptical denial but not uncritical faithful”. He is the protagonist of a documentary about UFO-Sweden titled “Ghost Rockets” in a 70 minute version premiered at the Gothenburg Film Festival on January 25th, 2015 and was broadcasted on Swedish television, shortened to 58 minutes. The film is directed by Michael Cavanagh and Kerstin Übelacker and has been sold to Norway, Denmark and Canada. Svahn has led two expeditions in 2012 and 2014 to the lake Nammajaure in Muddus National Park (Sweden) to search for a sunken so-called “ghost rocket” seen landing there in 1980. A new expedition is planned for winter 2018/19.